This is a scalable context timeline. It contains events related to the event Shortly Before 9:37 a.m. September 11, 2001: Helicopter Is Seen Flying outside Defense Secretary Rumsfeld’s Office. You can narrow or broaden the context of this timeline by adjusting the zoom level. The lower the scale, the more relevant the items on average will be, while the higher the scale, the less relevant the items, on average, will be. A helicopter belonging to the US Park Police Aviation Unit. 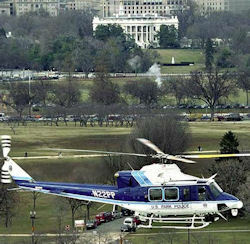 [Source: United States Park Police]A US Park Police helicopter is directed to intercept the aircraft that subsequently hits the Pentagon, according to the later statements of US Navy historian John Darrell Sherwood. The helicopter’s pilot reportedly describes the incident when later interviewed by a US Marine Corps historian. Details of the pilot’s account are then revealed by Sherwood, who is a colleague of the Marine Corps historian, while he is interviewing Jeffrey Mark Parsons of the United States Border Patrol about his experiences of the 9/11 attacks. 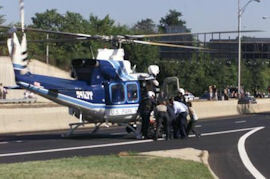 Pilot Is Told to Prevent the Plane from Hitting the Pentagon - According to Sherwood, the helicopter pilot, who is “an aviation sergeant with the United States Park Police,” is “in the area [of the Pentagon] and he got a call saying, ‘Try to intercept this plane, try to distract the plane, try to do something to, you know, prevent the plane from going into the Pentagon.’” It is unclear from what Sherwood says whether the helicopter is on the ground or already airborne at this time. In response to the instruction, the helicopter goes “to try to distract” the approaching aircraft. A number of witnesses see a helicopter flying near the Pentagon in the minutes before the attack there.